Represents Australia’s roots from England. The Southern Cross is also a significant navigational feature of the southern hemisphere. The Commonwealth Star, also known as the Star of Federation has 7 points. 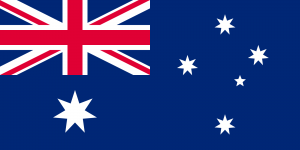 These 7 points symbolise the six states and combined territories of Australia. The red and blue circle represents the absolute, or duality (opposites) within the universe. The lines in the top left corner represent heaven, the opposite to earth in the bottom right corner. The lines in the bottom right corner represent earth, the opposite to heaven in the top left corner. The lines in the top right corner represent water, the opposite to fire in the bottom left corner. The lines in the bottom left corner represent fire, the opposite to water in the top right corner. 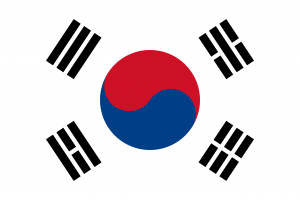 In reference to the nation of South Korea, the white background represents the land, the circle represents the people of South Korea and the 4 symbols represent the government of South Korea. Together these make up the essential elements of the nation. The fourteen laurel leaves on each side represent the 14 states of Korea. The six red berries represent the six continents of the world and the spread of Tang Soo Do worldwide. The middle character means ‘Moo Duk Kwan’. The left character is ‘Tang’. The right character is ‘Soo’. 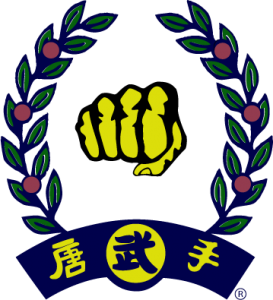 The fist in the middle of the Moo Duk Kwan emblem represents the ‘Fist of Justice’. The dark blue colour represents the three oceans of the world and the black belts.